Brighter than ordinary LED lights. Easily attaches to any windshield. Stealth ON & OFF built in switch. The Uber Light Up Sign is very eye-catching, easily recognized and visible up to 20 yards away. This beautifully lit, glowing blue UBER sign will help your passengers identify you quickly. It is bright enough to be seen through tinted windows, up to 90% tint. The UBERLIGHT sign is made using EL light technology which is brighter than ordinary LED lights. It fits perfectly on any windshield. Unlike bulky LED signs, the UBERLIGHT sign is thin and durable. You can go stealth mode with the Uber Light Up Sign. It comes equipped with an ON and OF button so you can turn it on before you pick up your riders and turn it off once they are in the car. With the Uber Light Up Sign, you can make yourself better than the average UBER driver. Be prepared to get some awesome feedback from your riders. Recommended for all UBER drivers looking to make a great first impression! Order your Uber Light Now! 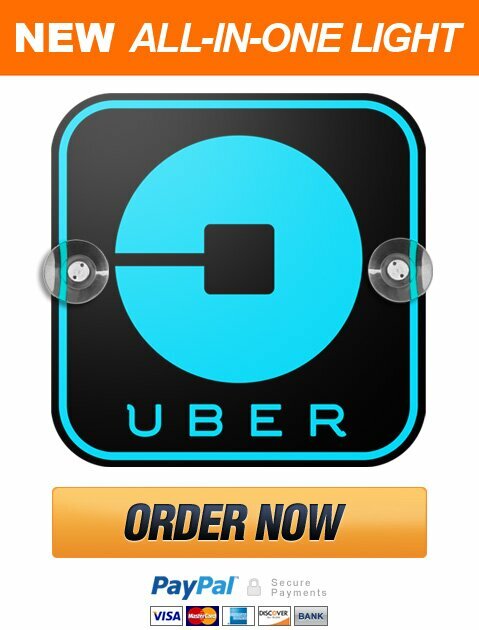 The Glowing Uber Sign is very eye-catching, easily recognized and visible up to 20 yards away. This beautifully lit, glowing blue UBER sign will help your passengers identify you quickly. It is bright enough to be seen through tinted windows, up to 90% tint. You can go stealth mode with the Glowing Uber Sign. It comes equipped with an ON and OF button so you can turn it on before you pick up your riders and turn it off once they are in the car. With the Glowing Uber Sign, you can make yourself better than the average UBER driver. Be prepared to get some awesome feedback from your riders. Recommended for all UBER drivers looking to make a great first impression!